This access statement does not contain personal opinions as to our suitability for those with access needs, but aims to accurately describe the facilities and services that we offer all our guests/visitors. We welcome all guests at Lodore Falls Hotel, including guests with an impairment which could include mobility, sight, hearing and learning disabilities. It is recommended that you discuss your requirements with our reservations team at the time of booking to ensure the most suitable room for your requirements is allocated to you. Situated in the Borrowdale Valley our hotel is the perfect place to stay whether you are visiting for business or leisure. The hotel is situated just off the road with a gradual approach, the driveway of the hotel is small stones, we have two steps to the front door and a door bell to alert the staff to bring out the ramp. We have 87 bedrooms including 2 accessible bedrooms suitable for wheelchair users (from October 2018) situated on the ground floor with step free access once in the Spa building. We have a further 2 accessible bedrooms in the main hotel on the first floor, only accessible by a small lift that is not suitable for Electric wheelchairs and may require transfer to our hotel wheelchair. All bedrooms have en-suite bathrooms. The en-suite bathrooms of the 4 accessible bedrooms all have level entry shower with handrails fitted throughout e.g. shower and toilet. For full details and maps of how to reach us please see the directions section of our website. Alternatively, you can plan your journey by car or public transport using www.theaa.com/route-planner; simply enter your postcode and ours, which is CA12 5UX to get directions. The nearest railway station is Penrith, which is 24.8 miles away. You can pre book a taxi by calling 017687 72676. If you require an accessible taxi this can be booked in advance by calling 01768 866842. The Lodore Falls bus stop is approximately 25 metres/27 yards from the hotel front door. The path to the hotel is gravel. Our Access Statement is available in larger print on request. We have limited parking for our guests with blue badges at the front of the hotel and can valet park if necessary. The main hotel car park is 50 metres from the Hotel entrance across the road, there is no charge for car parking for patrons of the Hotel. The main car park has a barrier that will require a 4 digit number to exit available at Reception or Bar. The main car park surface is tarmac and the Hotel drive way gravel path leading to the main entrance.There is a drop off point at the main entrance of the hotel and a bell available for assistance. There are 2 steps leading to the main entrance with handrails on both sides. A portable ramp is available. The main entrance double doors are manual and when pushed open wide enough will stay open, they are 1620mm wide, opens inwards and outwards. The second set of doors are automatic. We have a porter service available 24 hours a day to assist with your luggage. Reception is on the ground floor and has level access throughout. The entrance has a coya mat set into the floor but level with the rest of the Reception area which is carpeted. The area is evenly and well lit with overhead lighting and wall lights. A magnifying glass, pen and pad of paper are available on request. There is a choice of seating in the Reception area. A familiarisation tour is available on request. There are two lifts in the hotel one lift with an automatic closing internal gate and buttons. This has a mirror on the back of the lift, the sides are covered in a fabric material and the floor is short pile carpet. The second lift provides access to rooms 141 - 144 only, this has a mirror on the back and the polished aluminium finish and a hard plastic flooring. The lift dimensions are 800mm wide and 850mm deep and as such only small wheelchairs can access the lift. We have a wheelchair that fits into this lift, but would mean you transferring from one to the other. There are 2 Ground floor accessible bedrooms within the Spa building (from October 2018). You should park at the front of the hotel and alert Reception to your arrival by using the bell to the right of the front door or come to the front desk. We will show you to the room which is outside via an external resin gradual incline footpath, across the bridge into the Spa Building. The entrance way has Automatic doors leading to a Foyer. This area is carpeted throughout. The rooms in the Spa Building operated by an electronic key. All entry doors are 724mm wide and are easy to open, and they are on self-closers. Furniture can be easily removed or rearranged in the room if requested. In each room there is a transfer space of at least 1200mm/47ins on one side of the beds. The height of the beds from the floor to the top of the mattress is 600mm. Blocks to raise the height of the bed are available on request. Rooms are bright and evenly lit. Overhead and wall lighting is used. There are also bedside and table lamps in each room. Additional reading lamps are available on request. The height of the wardrobe rails are at least 1590mm. These, and all other bedrooms in the hotel, offer the following: All bedroom doors are marked numbers. Lighting as above, good colour contrast between the floor, walls and doors, short pile carpet, television with remote control and subtitles. Fire evacuation procedures are displayed on the back of the bedroom door. Guests are reminded to inform Reception if they would require any assistance in the event of a fire evacuation. In accordance with Lake District Hotels policy, all of our hotel bedrooms are No Smoking. All of the accessible bedrooms have en-suite shower rooms providing specific facilities for guests with disabilities, these include: • Doors are 660mm wide, easy to open. • The toilet height is 400mm. • The wash basin height is 800mm, with clear space underneath. • Grab rails, horizontal and vertical, are fitted around the shower. • Horizontal and vertical grab rails are fitted either side of the toilet. • Lever taps are fitted on the washbasin and bath. • Well lit with overhead lights and a fluorescent light over mirror. • Good colour contrast between the doors, floor, walls and towels. • The flooring is non-slip tile. • All accessible bathrooms are provided with emergency assistance alarms. • All other bathrooms have the same lighting, lever taps, floor fitting and good colour contrast as above. However, the shower is not separate and is over the bath. Corridors are at least 1340mm wide and the floor covering is short pile carpet. The Bar lounge area is situated on the ground floor with level entry from the reception and main entrance area.The Bar lounge door is 1830mm wide, exit through to the Conservatory is 900mm wide. The room has a mixture of seating with sofas and soft chairs with arms, together with low coffee tables. Lighting is natural daylight as well as ceiling, wall and table lights, and by night lighting comes from overhead and wall lighting used as well as table lamps around the room. The flooring is short pile carpet in both the lounge and the lobby with some hard wood directly in front of the Bar and Reception. Bar food and drink can be served in the Bar lounge, just ask at the bar for menu details. The nearest toilets are down the main corridor and include an accessible toilet. The Library area of the ground floor has level entry from the reception and main entrance. The door is 1590mm wide. The room has a mixture of seating with sofas and soft chairs with arms, together with low coffee tables. The lighting in the Library area comes from ceiling, wall and table lights situated around the Library. Bar food and drink can be served in the lounge, just ask at the bar for menu details. The Conservatory can be accessed from the Lakeview Bar & Lounge, the entrance door is 900mm which takes you into a foyer part of the conservatory. There are 4 steps to gain access into the Conservatory or alternatively can go outside down a small flagstone ramp and up along a resin finished footpath, into the foyer area outside Mizu Restaurant. There is an internal route via the side lounge and library. The room has a mixture of seating with sofas and soft chairs with arms, together with low coffee tables. Bar food and drink can be served in the Conservatory, menus are on the table, ordering is at the bar or ask for assistance. The restaurant is situated on the ground floor with level entry from the reception and main entrance area. Double doors to this area are normally open.The restaurant has level entry throughout, with the Cascade area being down steps. Tables in the restaurant are well spaced apart, with a clear height from the floor of 609mm/24ins, with upright chairs with arms. Lighting is natural daylight and by night levels are controlled by dimmer switches, with overhead and wall lighting used as well as table lamps around the room. Candles are lit on tables. The flooring is short pile carpet and hard wood. The restaurant is table service for breakfast, lunch and dinner. At breakfast there is a self-service buffet; however, staff can assist on request. All staff can assist by running through menus with you. The nearest toilets and accessible toilet are down the main corridor. Mizu is on the ground floor. The external entrance is 2000mm wide with automatic doors. Entrance into Mizu is via two doors 1900mm wide. Pull to go in push to come out. The flooring in the foyer and Restaurant is all textured tiles. Tables in the restaurant are well spaced apart, with a clear height from the floor of 609mm/24ins, with upright chairs with arms. Public toilets can be found on: the ground floor with level access from the main entrance, reception, lounge, bar and restaurant areas; the first floor just through the Library, including an accessible toilet, which is up a small incline down the corridor. • Entrance door 900mm wide and level entry into the toilet. • 1300mm transfer space to the front of the ground floor toilet when facing the toilet. • The toilet height is 490mm. • There are vertical rails either side of both basin and toilet. • There is a horizontal rail on the side wall adjacent to the toilet. • A flashing light when the fire alarm sounds. • An emergency alarm pull cord. • The toilets are well lit with fluorescent overhead lighting and there is a low level light switch. • The flooring is non-slip laminate. • There are lever taps on the sinks. • There is good colour contrast, tiles are blue, toilets & washbasins are white. • All other public WCs have the same lighting, flooring, lever taps as above. Our conference and meeting rooms are on the first floor and can be accessed from the main entrance/reception area. All of these rooms have level access throughout. The Maple room door is 730mm wide. The Ash room door is 1700mm wide. The Beech room door is 1700mm wide. The Boardroom door is 900mm wide. All rooms have natural lighting except 1 internal meeting rooms with no windows. Overhead lighting can be controlled by dimmer switches. Upright chairs with or without arms are available. Tables have a clear space of 609mm from the floor. The flooring is short pile carpet. The nearest accessible toilet is on the same floor by the Ash Room. Please contact our conference manager on Tel: 017687 77285 to discuss any specific requirements you may have. Our Falls Spa is accessible via the main hotel areas or directly via the pathways coming from the front of the hotel building. Access is via ramp pathways over the bridge. Wheelchair access is via the ground floor entrance and via the lift to level one. For assistance please press the button on the intercom at the entrance. Our Spa suite is housed over one level. Our spa building contains fourteen bedrooms which includes two accessibility suites suitable for wheelchair users on the ground floor level. These accessibility suites include wet room showers. The Spa building bedrooms are over three floors ground floor, level two and level three and are fully accessible via lift and stairs. We have 15 acres of grounds with a mixture of grass, woodland and shrubberies set around the hotel. Areas closest to the hotel are generally flat. To go to the Gazebo, there is a bridge, with a gentle incline, that goes over the river. This is a gravel path, but once over the bridge there is paving stones leading to the gazebo. There is seating at the decking over the bridge by the gazebo. This is wooden decking and there is level access from the gazebo area. The grounds around the hotel consist of grass and gravel paths, with some areas having gentle inclines. We have a set of evacuation procedures – should you require assistance someone will come to your room and help you with evacuation either out of the building or to a refuge. We have evacuation chairs to assist. Assistance dogs are welcome. 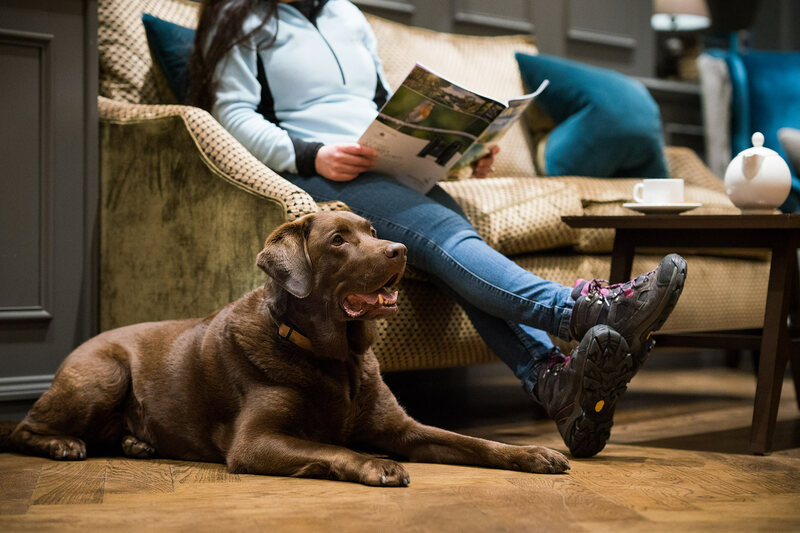 A water bowl is available just outside the main entrance for assistance dogs and one can be supplied for bedrooms or the bar lounge where necessary. Unfortunately, The Lodore Falls Hotel cannot offer personal care. Where personal care is required we recommended that guests contact their own local social services who may be able to advise them of approved care services local to the hotel. Room service is available 24 hours by dialling ‘709’ on the phone. We have an area where a mobility scooter can be charged, please ask at reception. The nearest General Hospital with a walk in NHS facility is 4 miles away. The nearest doctor’s surgery is 4 miles away. Please contact reception for further information. If you require further information which is not covered in this statement or should you have any queries, please let us know.